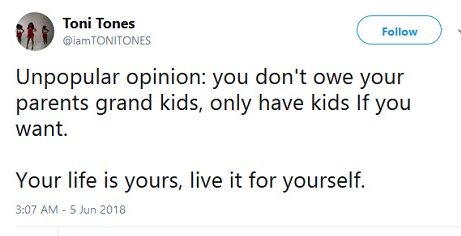 Lol, Toni Tones this afternoon is telling Nigerians they do not owe their parents grand kids and if they choose not to have kids, it’s just fine, lol. In other words, Toni is saying our parents had us because they want too, and if we don’t want any, we shouldn’t be forced to have any. Who’s with Toni?